TWO clubs set to go head to head with NUFC to sign West Brom’s Salomon Rondon – Report – NUFC blog – Newcastle United blog – NUFC Fixtures, News and Forum. According to the Northern Echo, Premier League duo West Ham and Everton will attempt to sign Salomon Rondon this summer. Rondon has been in excellent form for Newcastle this season, contributing 10 goals and 5 assists and playing a key role in our recent resurgence up the table. It is well documented the West Brom man will be available for a release clause of £16.5m this summer IF the Baggies don’t go up, which is now looking like it will come down to the lottery of the play-offs. If West Brom do gain promotion, it’s reported that the asking price will soar to well north of £20m as they can dictate their own terms; a fee that is fair for a proven Premier League striker in the current market, regardless of age, but one Ashley seems so unlikely to pay. 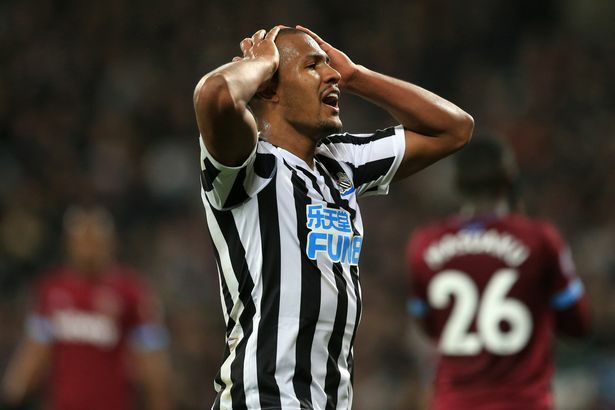 Rondon has made it clear his priority is to remain at Newcastle next season, and with Benitez making it clear the Venezuelan is key to his plans, the onus is on Charnley and Ashley to get the deal done, which never fills fans with much confidence. These latest developments do strengthen the hand of Rondon though as he now has two very attractive alternatives if Newcastle don’t deliver a permanent move come August. What do you make of the Rondon saga that is developing – how likely is it that he is still in a black and white shirt next season? And do you think he is worth the asking price if West Brom do go up?